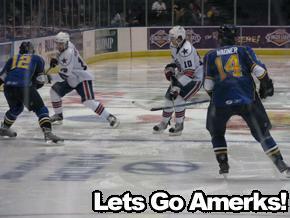 Weekend Ends With One Win and Two Losses · Let's Go Amerks! The Amerks finished the three game weekend with a win and two losses.Â They also managed to score more goals in the past three games than the previous nine combined.Â Up next they have a four game road trip against Grand Rapids (twice), Quad City, and Iowa. We’ve had a busy weekend and don’t really have a recap for each game, but will come up with the highs and lows of the weekend. We will leave with one of the biggest lows, according to Kevin O. of the D&C, Sundays announced crowd of 3,973 was the lowest in nearly 11 years.